Hopefully, y'all getting ready for Father's Day. I have a few recipes to help you show your hard working dad how much you appreciate him. Credit for originating Father's Day is generally given to Sonora Smart Dodd of Spokane, Washington, whose dad, a Civil War veteran, raised her and her five siblings after their mother died in childbirth. She is said to have had the idea in 1909 while listening to a sermon on Mother's Day, which at the time was becoming established as a holiday. Local religious leaders supported the idea, and the first Father's Day was celebrated on June 19, 1910, the month of the birthday of Dodd's dad. In 1924 President Calvin Coolidge gave his support to the observance, and in 1966 President Lyndon B. Johnson officially proclaimed it a national holiday. Observance on the third Sunday of June was decreed by law in 1972. In a large bowl, add chopped cucumber, red onion, tomatoes and salt. Add about half the bottle of Italian dressing. Mix together. Cover and place in refrigerator about 2 to 3 hours before serving. Enjoy! Quick and simple, I love it! Very easy and quick to add one more dish to the party! It was interesting to read the facts about Father's Day. I didn't know that. Happy Father's Day weekend, Christine! Hi Nami, have a wonderful weekend. Interesting write up about Father's day! That's a fresh & tasty looking salad :) Thanks for sharing, Christine! 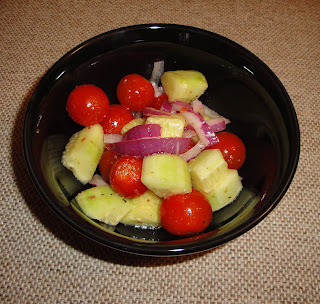 Great salad and a versatile side for any meal. I bet my hubby would love this simple salad. Hi Cindy, I love salad too! Thanks for stopping by. Delicious and simple -- love classics like this.